The complete Nabaca set: no compromises any longer! The Nabaca is the first comfortable modular carrier on the German market which is absolutely flexible and adjustable for all your needs. If you are reserving this carrier without coming to a workshop or advice session, please let us know which carrying panel you think you may need, so that we can set it up for you. (Panels are small/newborn, medium/bigger baby & large/toddler. Completely made of woven sling fabric in broken twill weave. 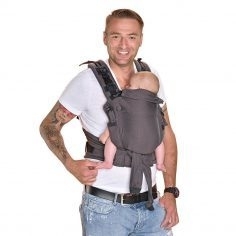 Carrier panel available in three sizes (S, M, and L) – for carrying right from the beginning until the end of the individual carrying time. The wide and padded shoulder straps and the waist belt are flexibly adjustable to different sizes and will be gentle on your neck and back. Instructions for the Nabaca can be found here.